Like many others, I like drawing portraits. I like the expressive qualities of the face and also enjoy the challenge of getting something that looks like the person I am drawing as well. In order to be able to balance both effectively I find it helpful to know how to construct a head and face rather than just copying the all the details I see. 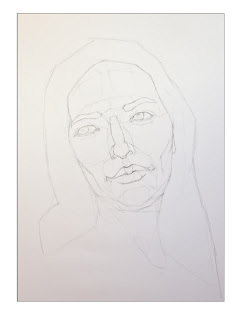 I want to be able to understand the forms created by the head and face in order to get a likeness and capture the expressiveness of the person that I am drawing. Today, I thought we could look one of the ways I like to start out when drawing a portrait. We will look at the steps to find the forms using basic shapes and the surface planes as a way to construct the structures of the head. 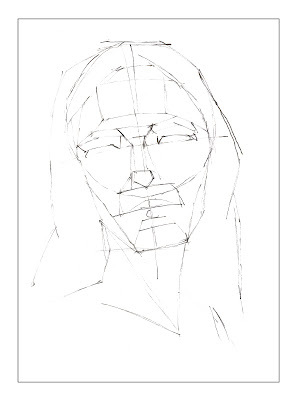 Before we begin, take a look at the head proportions page in the drawing basics section, as I will be using those proportions as a guide but will not specifically mention them here. 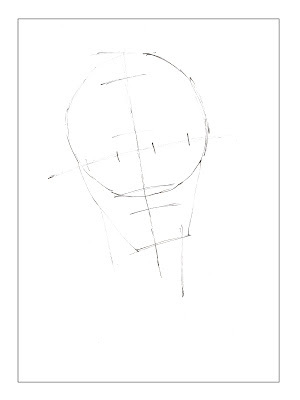 Starting with the simple mass of the head shape. 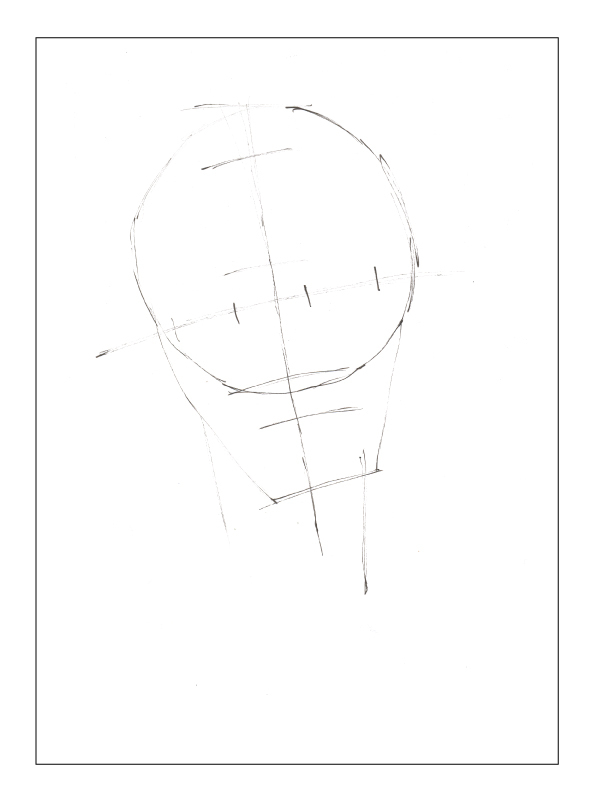 First, we want to identify the most basic shapes of the head. 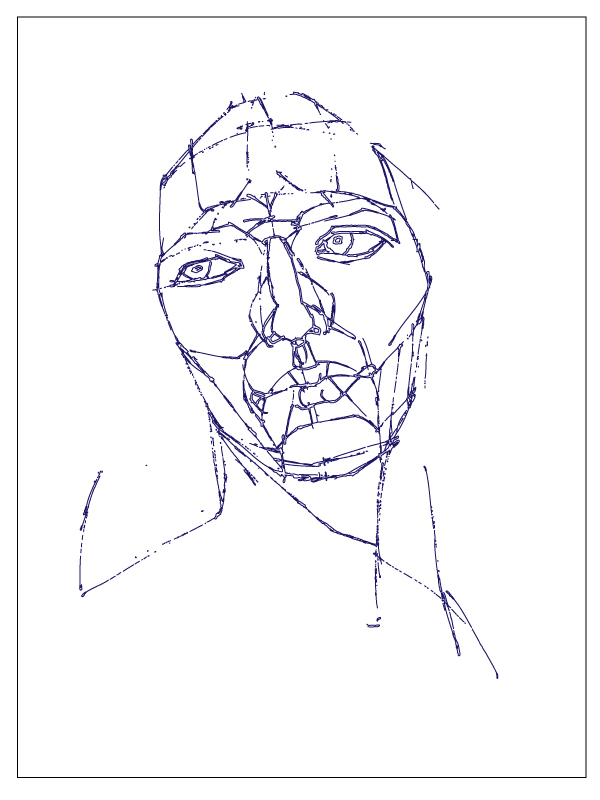 We are abstracting the form of the head to its most simple structures as a way of getting us started. We use these to make sure that the height and width of the head are roughly accurate and allow us to decide where we want to place the head in the composition. I like to break head down into the shapes of a circle, to represent the cranium, and a wedge, to represent the face and jaw. There are other shapes to use as well. 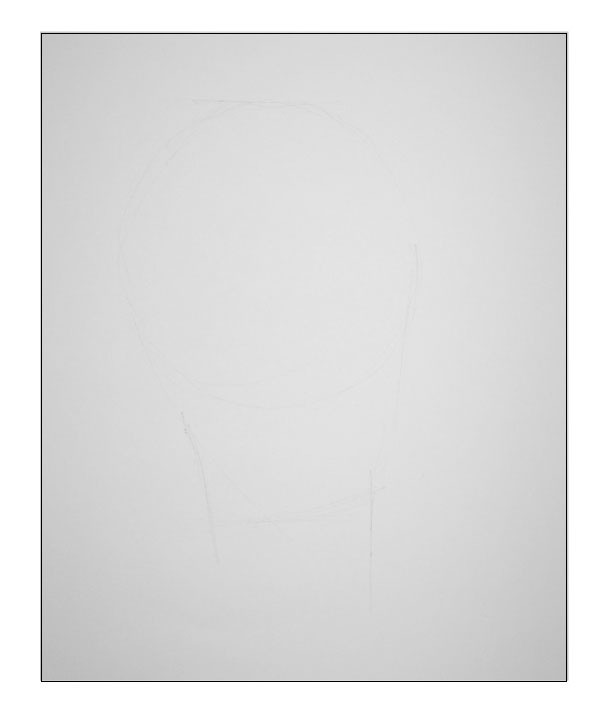 For example, some might like to draw the head as egg shaped. 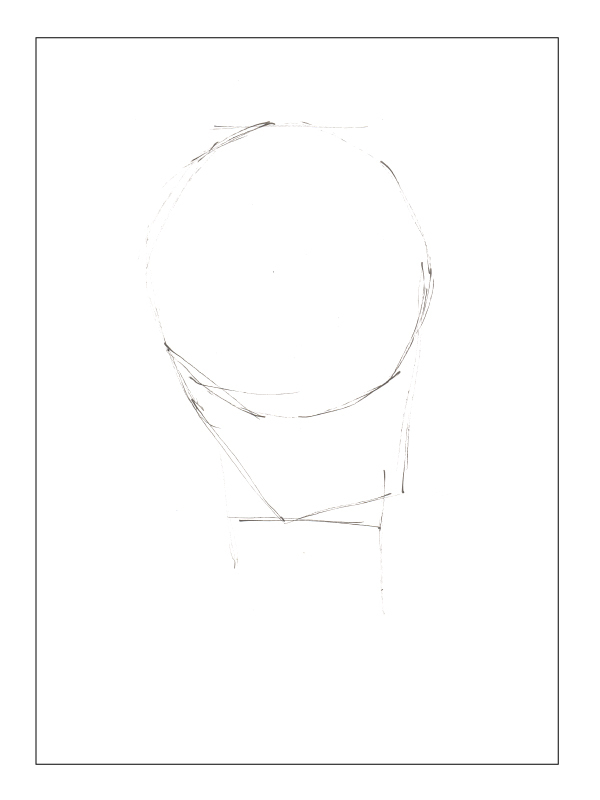 Once we have decided on the shapes we can lightly sketch them onto the paper. 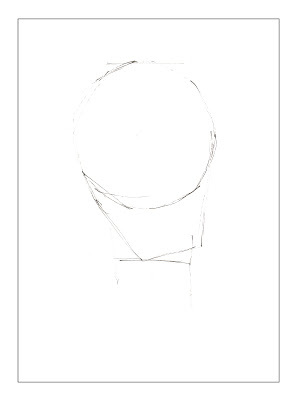 The lighter you keep the lines at the beginning stages the easier it will be to rework if we need to adjust your drawing later on. To the left is an image of the original charcoal drawing at this stage. The lines have been drawn to be barely visible. 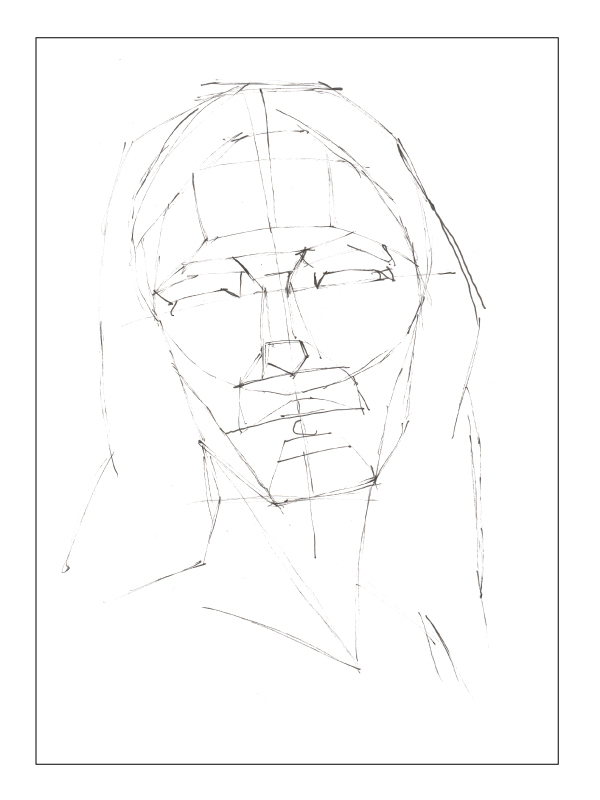 Next, examine the model to evaluate proportions of the features of the head and face as they are from your view. We don't need to draw the shapes or forms of features just yet. 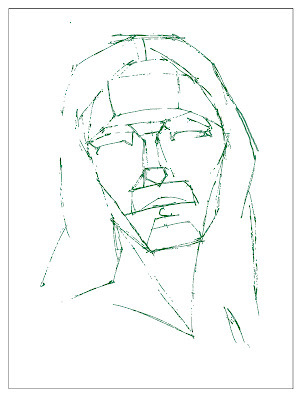 We can sketch in a center line of the head and the eye line. Once we have done that, we can draw the locations and boundaries of the features to check if they are the right size and in the locations we want before we draw the features in. That way we don't have to redraw the details if we decide we must correct something about the size or placement later on. 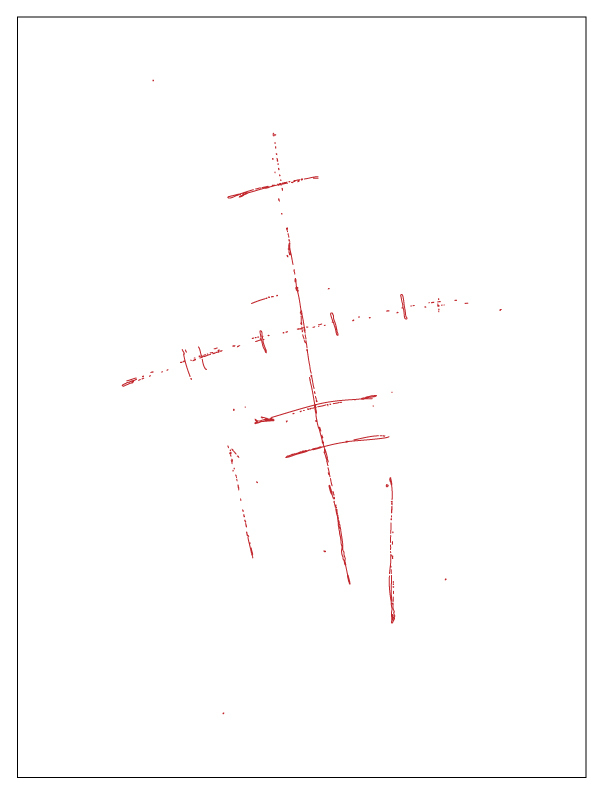 To the right is an imagine of the lines drawn in this step isolated from the previous step. 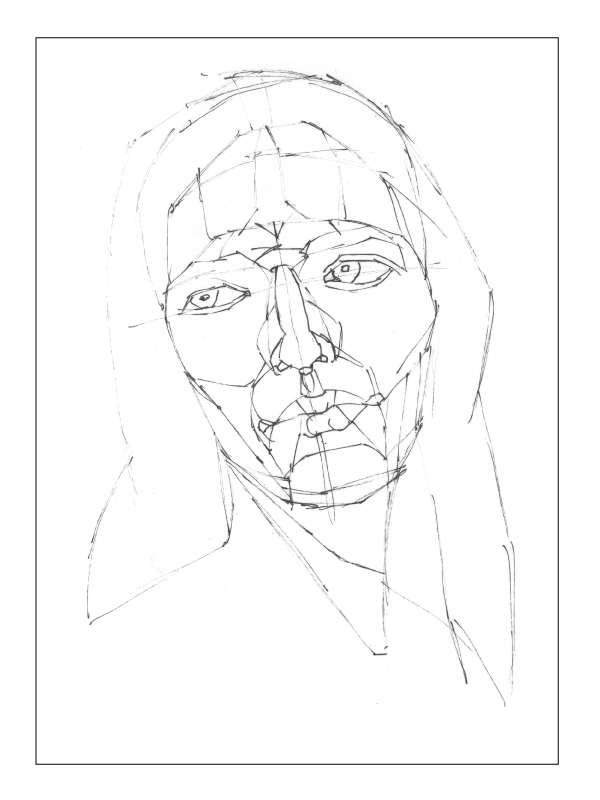 Now we can look for the smaller shapes that are made by the head and features of the face. 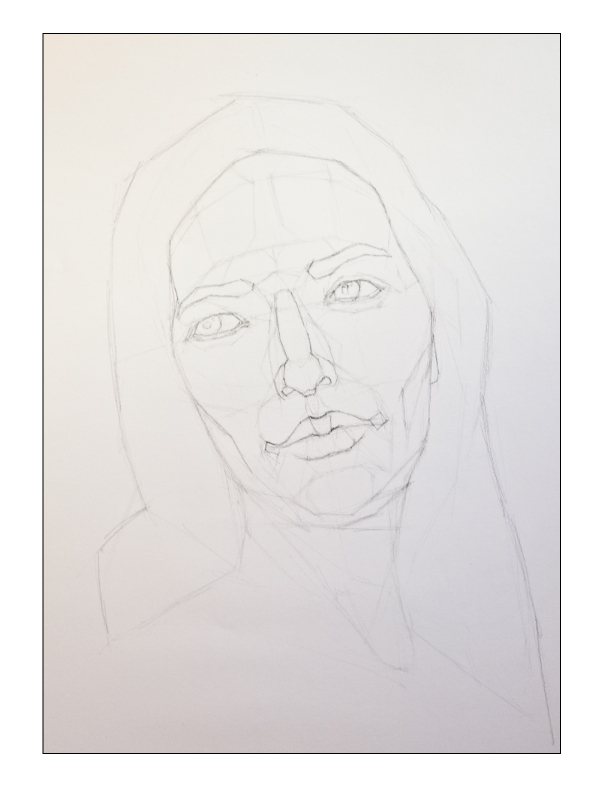 We can start drawing the forms made by the features and looking at the plane changes of the surfaces of the face and head. 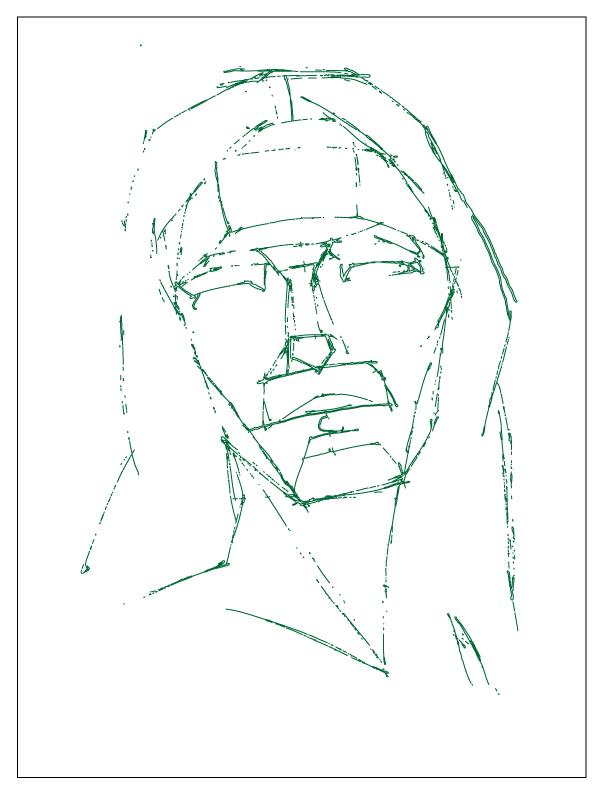 At this stage, I like to keep things fairly simple as I draw the features. I do this to make sure that the size and shape of the features and forms are what I want before I invest time in drawing more of the detail. 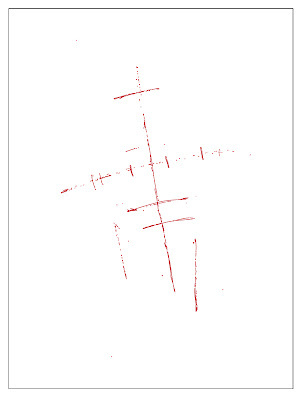 To the right is the imagine of the lines drawn in this step isolated from the previous steps. This next step is really just a continuation of the last step. We are just building off of the shapes we laid down earlier. We are just working on smaller shapes now. This is when I like to let the features take shape as I begin to feel comfortable with how everything is connecting and relating. I can continue to refine and adjust my drawing as far as I need. The more information I put down the more I understand the forms when I am ready to move onto shading. 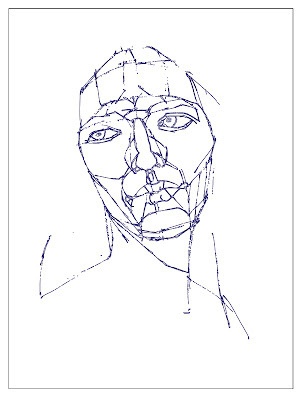 Another imagine of the lines drawn in this step isolated from the previous steps. 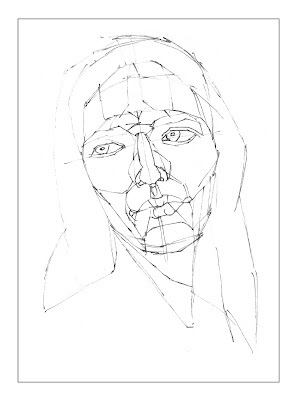 To the right is the image of the final version of the line drawing in charcoal. 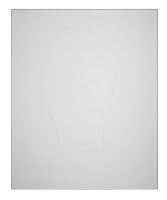 I am now ready to add in the shading and illustrate form using different levels of value. I like to think of this first part as building up the structures to prepare for the light and shadow effects, a kind of framework to work off of. I like this approach because it divides the information up into more manageable groups and I can focus on one thing at a time.